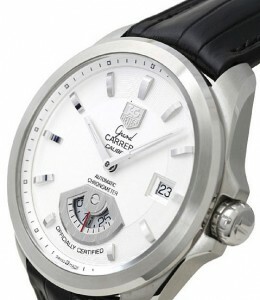 The TAG Heuer Grand Carrera Men’s Watch WAV511B.FC6224 is a classy timepiece of striking silver and chrome design. Made with a polished steel casing, the white dial and silver index bars compliments the watches refined appearance. 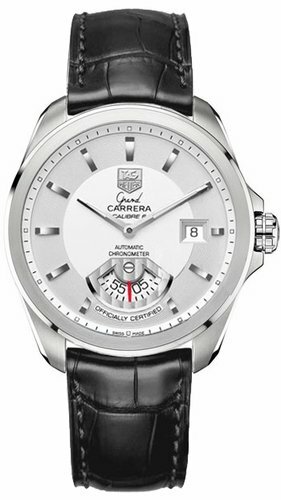 The TAG Heuer Grand Carrera features a chronograph window. Silver toned hour and minute hands track time by the chrome indexes which are all marked with a luminescent material. Also running the length of the dial are small minute markers that promote a minimalist design while still proving functional. A small aperture at the three o’clock position houses the current date in black numerals, strikingly clear against the white dial. Between the 5 and 7 o’clock position is a counting disk that acts as a second hand. The Grand Carrera is powered by a self winding chronometer movement and is certified to meet the precision standards of Swiss timepieces. If the precision and style weren’t enough, all TAG Heuer watches have an etched design of their traditional insignia as proof of authenticity. For this model, the etched insignia is located at the head of the silver crown which can be wound to keep the watch running regularly. The WAV511B.FC6224 has a brilliant chrome and white design. The dial of the Grand Cerrera WAV511B.FC6224 is protected by solid sapphire crystal plating on the front and a secondary crystal plate on the back. The rear casing allows for a clear view of the automatic chronometer movementand for easy access if the watch ever needs maintenance. The crystal plating of the WAV511B.FC6224 is swabbed with an anti-reflective solution to guarantee the best possible visibility. The watch is secured by a black alligator leather strap and a deployment buckle for a snug and stylish hold. The watch case is water resistant up to 100 Meters, but the leather may not hold so well under prolonged exposure to water, so it may be preferable to switch out the leather strap for rubber or metal models. Overall the TAG Heuer Grand Carrera WAV511B.FC6224 is very basic in its function, only offering the standard date and timekeeping. Even with these basic functions the Grand Carrera is manufactured to be as accurate as possible with its Swiss precision standards and boasts a sophisticated style with plenty of flair to spare. The WAV511B.FC6224 is a recommended choice for any man seeking a watch to compliment their wardrobe.